This is a Scottish style wedding as the groom's side has Scottish descent. The bride and groom got married at Sunset Club in Seattle in December of 2014. This shot is taken during the dance reception. And it's pretty much how I started wedding photography. The bride is actually my sister Frances. In the summer of 2014, my brother Niels got married and I just brought my camera along for fun. No second shooting or anything serious. Soon after that summer my sister got engaged, and my other cousin who's also a photographer decided to shoot her wedding. Surprisingly, my sister approached me, "Your pictures at Niels' wedding are beautiful, would you mind helping shoot my wedding along side with cousin?" Of course I said yes in a heartbeat. It was my huge honor to be given this level trust and photograph somebody's wedding especially it's my own relative. It added a whole different meaning and responsibility. I think at the time I was still using my Canon T2i, but I have already invested in a 70-200mm lens. 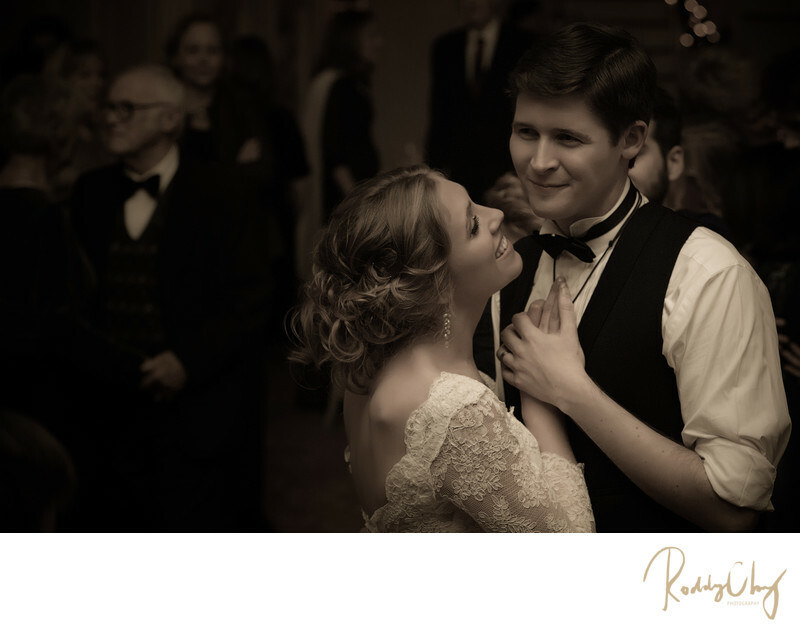 Along with the 50mm f/1.2 prime lens, I rocked on the wedding photojournalistic experience with so many great pictures. And this is one of them. The pure joy and smile of the bride looking at the groom and the content coming out of the groom, at this moment, forever captured in the sense of timelessness. Location: 1021 University St, Seattle, WA 98101.